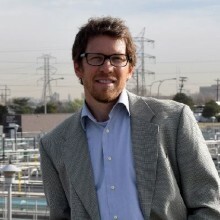 Mr. Jim McQuarrie is the Director of Strategy and Innovation for the the Metro Wastewater Reclamation District, the regional wastewater treatment provider for the greater Denver metropolitan area. The purpose of his new Department is to help the District focus and build its internal capabilities and external relationships that help to embrace the changes, opportunities and challenges that face his organization and the water-scarce front range where economic and population growth is unprecedented. Mr. McQuarrie began his career in rooted operations and then spent the majority of his time in the industry in private consulting before gladly joining the District in 2010. He has led the District’s treatment process optimization efforts, with a focus on innovation in operating practices as well as emerging technologies and technology adoption. Mr. McQuarrie is a graduate from Rutgers University (BS) and Colorado State University (MS). He has participated as an author in several WEF practice publications and is active with the WEF/WERF Leaders Innovation Forum for Technology (LIFT).